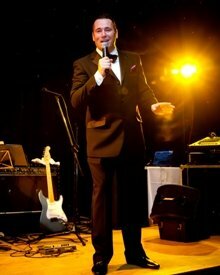 Andy Miller Swing Singer for weddings, corporate and private parties. Andy Miller is a swing singer who offers a set of classic swing, with some of the best music from that genre including Rat Pack, Big band, Harry Connick & Michael Buble. A passionate performer with a wealth of experience his performances are unique, and his unmatched chemistry with the audience sets him apart from other singers. Andy Performs some of the classics songs from the era of big band and swing including Frank Sinatra, Dean Martin, Sammy Davis Jnr., Nat King Cole, Bobby Darin and Tony Bennett. Andy is also a fantastic tribute act and his tribute to Mr Robbie Williams (back at the Albert Hall) and the maestro himself Michael Buble is always in high demand throughout the country. Few singers in Scotland today can match the smooth delivery and personality of this acclaimed singer. No matter what the event Andy Miller will take you on a journey from the old standards, right through to the modern swing of today. Andy's show entertains and delights audiences from Clubland to some of the top hotels and theatres in the country. He is available for Weddings Theme Nights, Receptions, Charity Balls parties and Corporate events. Andy delivers a professional and entertaining show wherever he performs. Don't miss Andy Miller tribute to Swing.